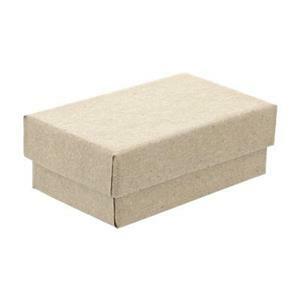 2.5x1.5x.88 inch Kraft Earring Jewelry Gift Boxes, cotton filled. SEE NOTES. These small jewelry boxes are made from rigid white lined board and are filled with non-tarnishing cotton. Perfect for finished finger rings, posts or small earrings. Notes: Box orders of 20 or more will incur dimensional weight add-on fees for shipping due to new FedEx guidelines on parcel size. Please call Customer Service at 800-528-0535 with any questions.